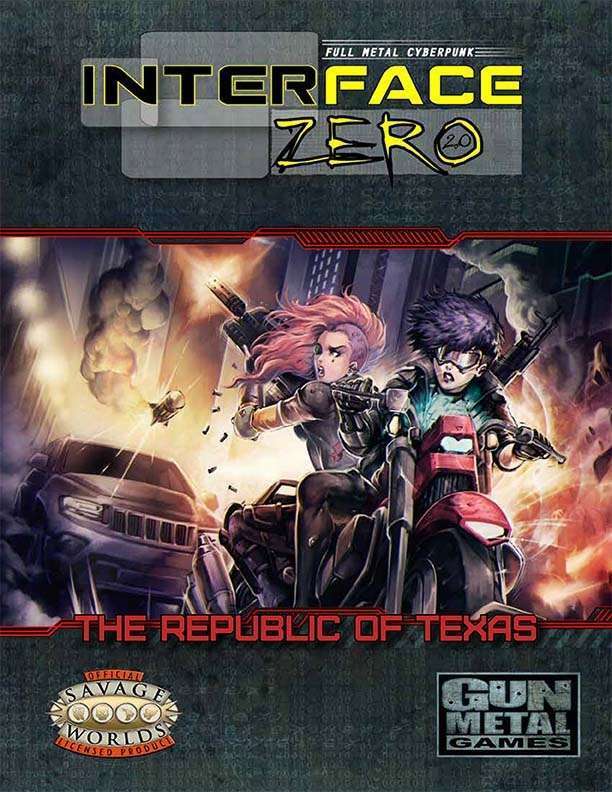 Fans of cyberpunk and Savage Worlds fans will both enjoy a trip to the Lone Star State in this latest Interface Zero 2.0 release – the Republic of Texas. Ask any Texan and they’ll tell you that life in the Republic is about one thing: freedom. Life here isn’t a cakewalk, but it’s far better to die on your feet than live on your knees. That’s Texas in 2090, amigo, better get used to it. Learn what it means to be a citizen in the Lone Star and how Texans remember the breakup of the old nation in order to form their more perfect union. This is a land where freedom reigns supreme because it’s surrounded by enemies and uncertain allies on all sides. Engage in high-tech espionage in the new range wars. Go south and live lawless, or head to the Austin-Antonio sprawl and get closer to the center of power or trapped in an AI/gang turf war. Plunge head first into the Runenberg Corporation’s financial data fortress nicknamed “the Mountain.” It’ll take more than gumption to survive, but it’s a start. You in?